Xavier Serbiá: "Entrepreneurs are Made, Not Born." The best thing about Serbiá is that he knows his audience well and how to talk to them so everyone can understand. The transition from pop singer in the well-known 80s phenomenon, Menudo, to the host of CNN Dinero, evidenced what Xavier Serbiá declared in front of 350 entrepreneurs at his latest seminar — that anything is possible in the world of economics as "entrepreneurs are made, not born." Serbiá, who acts as a motivational speaker in addition to being a financial expert, played the role of keynote speaker at the Su Socio de Negocios Business Expo at the Quiet Cannon in Montebello this past Wednesday. 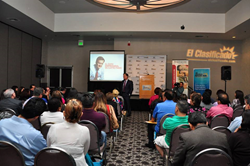 As a well-known public figure due to his spontaneity and the knowledge he shares, many Latino entrepreneurs and Hispanic small business owners arrived to hear him speak at the event presented in collaboration with El Clasificado. "The best thing about Serbiá is that he knows his audience well and how to talk to them so everyone can understand," explained Marta Mazariegos, one of the attendees and owner of a public relations firm, adding, "He talked about some topics that we may already know, but are always good to discuss them again and be fresh in our memories." Nitzia Chama, on the other hand, after listening to the Puerto Rican expert assured that "the generation of new business owners need to attend presentations by these types of experts," said the model and hostess looking to start her own business. Discussing three key steps to start a business, Serbiá pointed out that " First you have to define what you want to sell, whether it's a product or service. Then, who are you selling it to. The market, define it and make it clear. Lastly, how much do you need to invest in order to make it happen, the financial aspect." In addition, while he also urged future entrepreneurs to start their own adventures, he also reminded them hat half of businesses fail within the first four years, not necessarily to dissuade them from their dreams, but to remind the attendees to be mindful that their ambitions are developed with plans designed for success. The event sponsors were New York Life, Fountain of Youth, Forest Lawn, California Hispanic Chamber of Commerce, El Clasificado, and EC Hispanic Media. 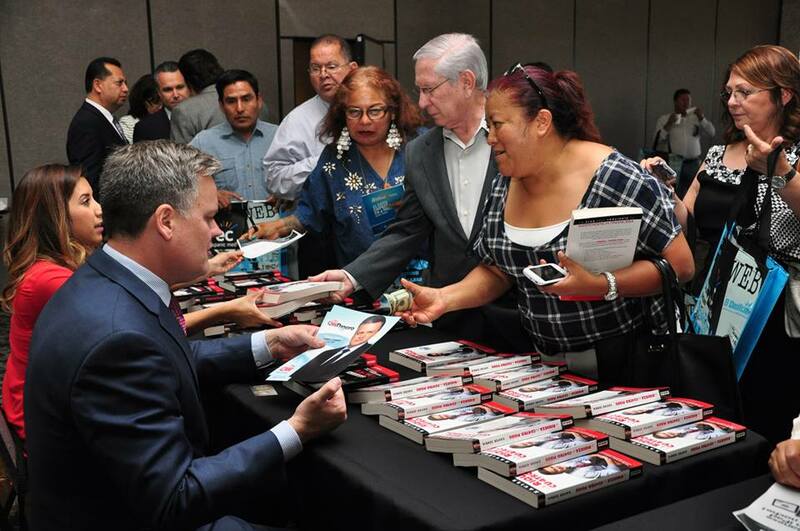 The next Su Socio de Negocios breakfast will take place on July 30 in Riverside. Guillermo Quiroz, Entrepreneur and host of the weather segment for Univisión 34 will be the keynote speaker. RSVP here. Su Socio de Negocios is a series of events and expos in Spanish that El Clasificado debuted in 2006. 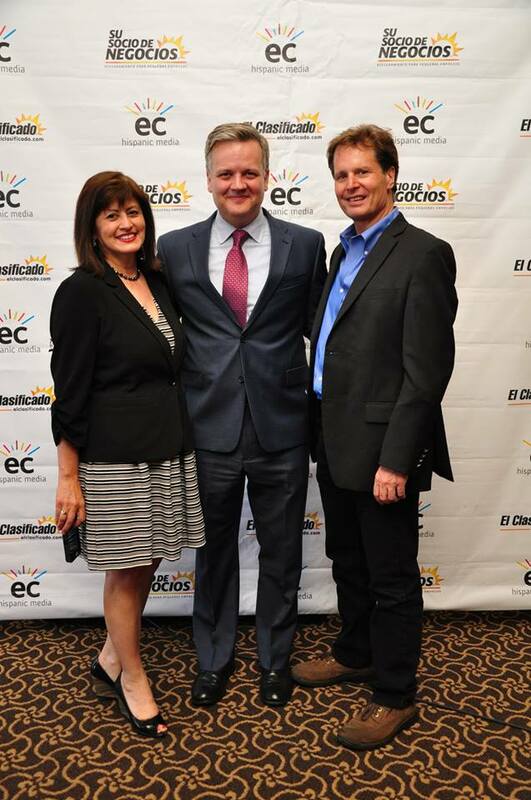 El Clasificado, an EC Hispanic Media company, is a multi-platform media company that connects buyers and sellers in the Hispanic community. El Clasificado’s print magazine has a verified weekly circulation of 510,000 that reaches 1.5 million weekly readers and is distributed from Fresno to San Diego and most recently to Yuma, Arizona. EC Hispanic Media also owns and operates elclasificado.com, which reaches 18 million monthly page views and susociodenegocios.com, which offers Hispanic small business owner’s information on how to grow their business.